Hello, as you all know, I am a online shopping addict! I am also a student so I understand the broke feeling! However, it will be great as you can earn cash when you shop online right? Today I am going to introduce ShopBack to you all. 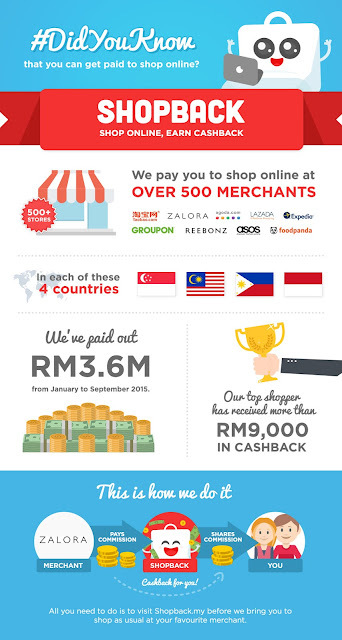 ShopBack is the most popular cashback site in Malaysia where you get to earn cash when you shop online. Just click through and shop from the merchants through ShopBack, you get your cashback as ShopBack will will return a cut of its commission given by the merchant back to you. The cashback will be credited into your ShopBack account and you can then cash out into your bank account for REAL cash. It is just as simple as 1-2-3 steps. Create your ShopBack account and you will be able to browse through a wide variety of online merchants from the site. After you pick a store, click on “SHOP NOW” and you will get redirected to the store’s site. From there, just shop as usual. Enjoy your cashback. After successful payment, your cashback will transfer to your ShopBack account and you can then cash out to your local bank account. It is just so easy right. From now on, you can check daily for Lazada Voucher, earn cashback when you shop with Althea Malaysia and enjoy Hermo cashback. It is a great deal isn’t it? Sign up now at ShopBack Here and earn RM 5. You will receive another RM 5 when you make your first purchase. Remember to sign up here!